Think of Bali and almost immediately images of palm fringed beaches spring to mind. In fact, Bali’s beaches are probably the biggest single reason for booking that trip to paradise. While those palm fringed, picture-postcard beaches do exist, there is also the wild coastline of the west of Bali with black volcanic sand beaches as well as aquamarine lagoons of Lembongan Island and the sleepy coves in the north. The island of Bali is truly blessed with the line of beaches surrounding it and they are all spectacular. Every beach on Bali has a character and charm all of its own, whether it is noted for great surfing, scuba diving or just uninterrupted sun worshipping. On the south eastern side of Bali, Sanur Beach is easily reachable (about a five — ten minute drive) from Denpasar. Sanur is an excellent site to watch the sun rise and set and is the archetypical palm lined white sandy beach of tropical dreams. Sanur is developed but also maintains its traditions. Only a stone’s thrown from the beach you’ll find ancient temples standing as solemn and proud today as they have been for centuries. Sanur is one of the most popular beaches on Bali, enjoying a great mix of both character and energy. With a reef at its northern end and a quiet, sprawling bay to the south, it really has the best of everything to offer. Sanur is also popular with European travellers and is one of the oldest resort areas in Bali. It balances both a traditionally calm and relaxed atmosphere with modern restaurants and luxurious hotels. Its wide sands are known for the stilted fishing boats or ‘spider boats’ that make their home there when not at work on the sea. Between June and August, Bali experiences near-constant warm easterly winds, making for perfect kite-flying weather. The annual Sanur international kite festival is held every July in Padang Galak and is famous for the huge and colourful kites that are flown. Some of the giant kites can be up to four metres in width and a huge 10 metres in length. Although there is a very relaxed attitude to the event from its organisers, the competition is taken seriously by everyone who enters. Kites are flown by teams of 10 or more and the tails of the kites can be as long as 100 metres, creating not only a colourful and fun atmosphere, but amazing photograph opportunities. Individual competitions include the longest flight time and a new entrant award. The event is more than a bit of fun and the kites carry a religious intention, sending prayers and messages to the Hindu gods to encourage abundant crops and harvests for the year. 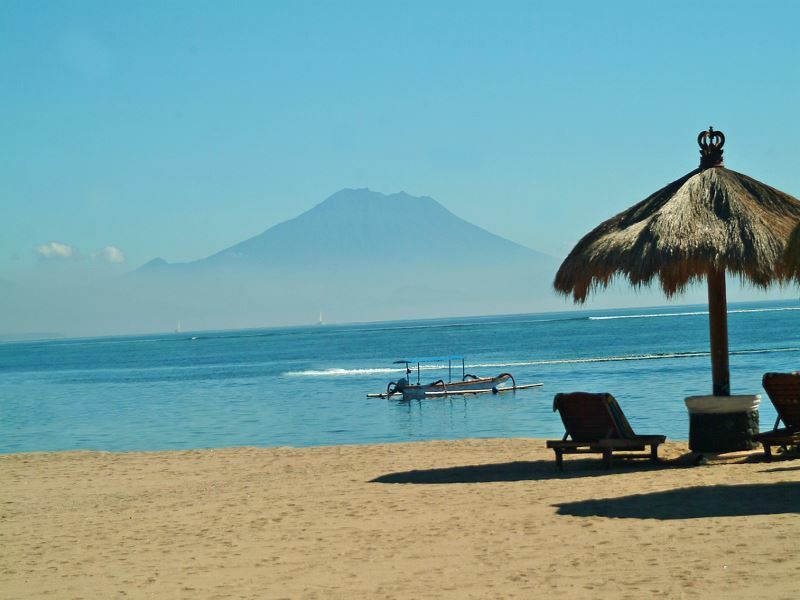 The three kilometre Sanur Beach really offers everything for both new and regular travellers to Bali. There are some fantastic hotels just a stone’s throw from the beach and are well worth checking out. The Pavilions prides itself on being an ideal romantic hideaway. It is a 30 minutes from the airport and only a stroll away from a stunning lagoon that is fringed on one side by a reef, and on the other by a long white sand beach. 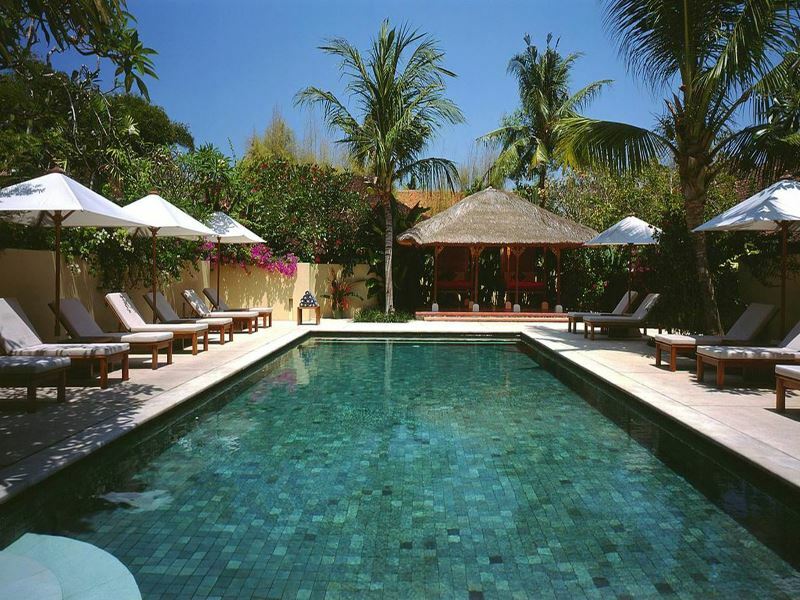 Accommodation is laid out as 24 quiet villas styled on traditional Balinese architecture and set in tropical gardens. The charming Segara Village Resort is set right on the beach at Sanur in five acres of beautiful tropical gardens. The rooms are divided into five distinct and characterful Balinese villages, creating a sense of community. Whether you are a regular visitor to Bali or have never been before, Sanur’s beauty never loses its charm and should definitely be on your list of places to visit. Legian sits on the opposite side of Sanur and stretches along the south western side of Bali, only a short drive from Denpasar or the airport. Surfing is a major activity in these beaches. Much livelier and far more 'touristy' than Sanur, Kuta offers shops, pubs and bars and a host of other facilities. If you like what Kuta offers, but would prefer something less crowded, then try Lovina Beach in the northern tip of the island. It’s well known for spectacular sunsets, snorkelling, and diving as well as its night life and is the best place to see dolphin sporting and playing just off shore. In Balinese, the word ‘Legian’ is used to describe anything that is delightful to the senses. Some names are totally deserved. 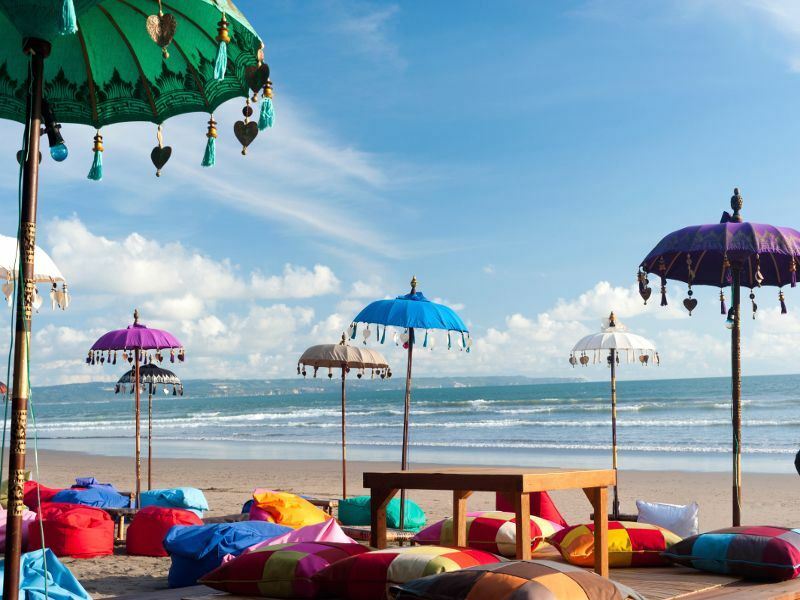 Legian has a quicker pulse than other beach resorts and is arguably the second most popular beach in Bali after Sanur. It manages to exude a revitalising energy, which contrasts the static beauty of the palm-lined surf. Legian succeeds in never becoming too crowded or rowdy however, and balances the popularity of its bars and hotels perfectly with tropical relaxation. Legian’s paved walkways and seafront hotels offer a buzz of activity in the evening and is a great example of island night life, Balinese style. Don’t be fooled though, this is not the Far East’s version of Benidorm. You won’t find drunken football fans hanging out of bar windows and lager-swilling contests in thumping nightclubs. Everything at Legian is a balance of luxurious style and tropical beauty. On a Saturday and Sunday nights, it hosts informal music events featuring fire jugglers and local musicians. Surfing is a major activity in parts of the beach and the rolling waves attracts a lot of surfers throughout the year. Kuta lies to the south of Legian and is a much livelier resort offering more of a touristic feel. Kuta’s shops, pubs and bars are popular, particularly as it is close to the airport so is a good place to spend some time before heading back to the airport at the end of your holiday. At the far south of Bali, Jimbaran is directly south of the airport, on the way from Denpasar towards Nusa Dua. The village of Jimbaran is the narrow “neck” of the island of Bali and because of that it features two remarkably different beaches. 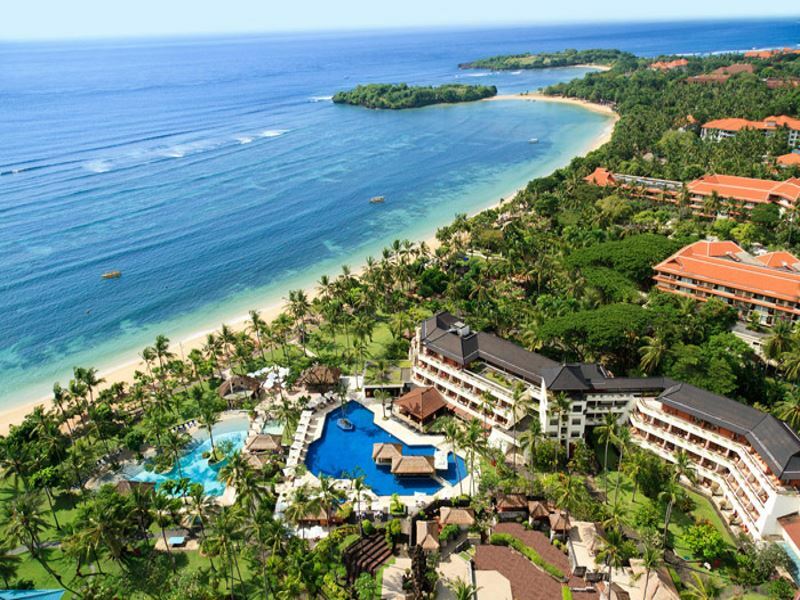 On the west, Jimbaran Beach faces the Jimbaran Bay, lined by new luxurious resorts. On the east, the beach faces the body of water sheltered by Benoa Harbour. Nusa Dua is a new luxurious resort area where the world's most sumptuous hotels gracefully integrate into the beautiful white beaches. 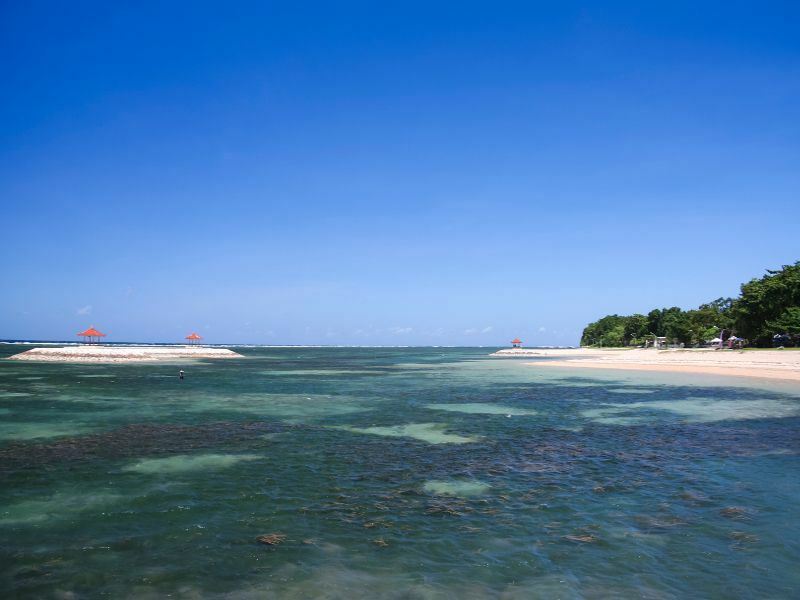 Crystal clear water provides excellent snorkelling and diving and the waves on the northern and the southern part of Nusa Dua make for great surfing. If it’s solitude you are looking for, then on the way to Gilimanuk (the ferry port that connects Bali and Java) you’ll find the small, but exquisite, Soka Beach. Continuing along the path towards Gilimanuk, near the village of Pulukan, Medewi is another beautiful beach. More information and to book: Bali has a huge amount of activities and really offers something for all travellers; a rich culture, sports, wonderful food and a variety of coastline from wide sandy beaches to rugged cliffs and dramatic coastline - just take a look at the incredible Bali beach holidays available from the popular Melia Bali in Nusa Dua to Kuta's luxury The Samaya Seminyak. If you’ve never been before, it has to be on your holiday bucket list.